Twelve years after his Father abandoned him Gon Freece wants nothing more than to become a Hunter, an elite title that gives access to magic and a whole assortment of privileges, to understand why his Father decided to leave his family. He sets off from whale island to take the Hunter test and along the way befriends fellow Hunter candidates Kurapica and Leorio. Hunter X Hunter starts off with a fantastic concept, it’s a world that has magic but the power is limited to only an elite few who need to obtain the rank of “Hunter.” Immediately you have that Shonen style quest but the reward is the ability to obtain more power, as opposed to the standard formula where the hero needs to obtain a power in order to complete the quest. This opens up huge possibilities for the narrative beyond this initial chapter, and what little I saw of the world made me excited to see those adventures. 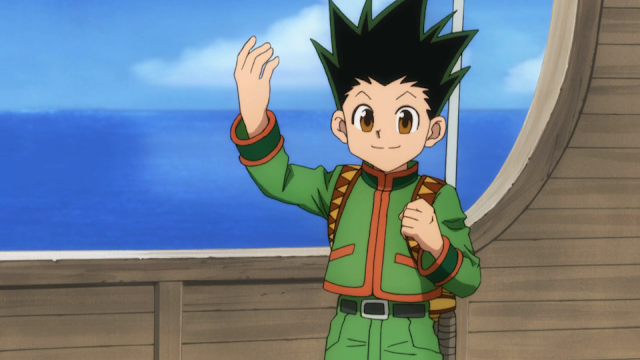 The two additional cast members introduced along with Gon, Kurapica and Leorio, are colorful and already have planted seeds for their own side narratives. Gon himself wants to become a Hunter to understand why his father abandoned him, Leorio wants to be a Hunter so he can make money, and Kurapica has a much more traditional reason for wanting to be come a Hunter; revenge against the bandits who destroyed his clan. These introductions immediately create compelling characters with the promise of rich backstory. The world established in this first episode has me the most intrigued. The only piece of the world we see is whale island which is a small, traditional fishing village but the main characters represent three extremely different cultures, implying that this world must be varied even beyond the cultures we’ve seen already. Especially in Leorio’s case with him in a modern suit and wanting money so he can buy such modern conveniences as cars. Yet the world we’ve seen so far seems pre-industrial. With these characters from such different cultures it’ll be interesting so see how they clash and how the world they live in actually works. The animation is expertly crafted combining the character designs and style of this ten year old manga with colorful and cheerful animation. 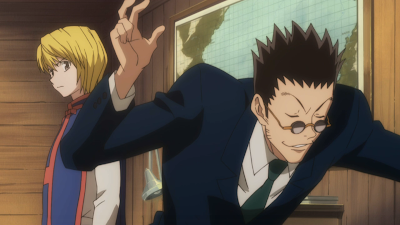 The character designs help to hint at the variety of the world and the simple designs someone make it more believable that Leorio and Kurapica could exist in that world, something that might have been a stumbling block if handled with a greater sense of realism. 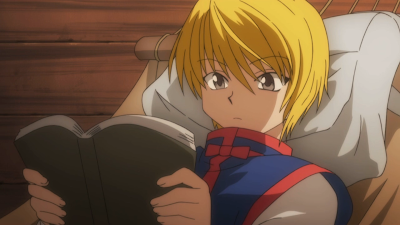 Hunter X Hunter looks to be an interesting and exciting Shonen series. The first episode was a delightful introduction to compelling characters, narrative threads, and a rich world waiting to be explored. With twenty-nine volumes of manga to draw from this could be the next big Shonen hit if it pays off even a fraction of what it started.